scholarships being also conferred to the outgoing batch of working executives. The event was thrown on April, 13, 2016 at Alliance Francaise de Delhi. Mr. Sanjeev Bikhchandani, Co-Founder Info Edge India Ltd was the Chief Guest of the annual function who also made the convocation speech. Mr. Rajiv Tewari, Co-Founder & Conceptualizer, The Delhi School of Communication and CEO, True Wealth Creators and Integrated Media Network & Ms. Bhavana Mittal, Head of Media, Indian Sub-Continent, GSK were present as the guests of honour for the occasion. Many other eminent personalities and dignitaries were also present at the convocation programme. The graduating batch has seen lucrative placements in diverse areas such as Media Planning, Client Servicing, Creative, Digital, Film Production, Marketing & Business Development and Strategic Communications from various prestigious organisations such as GSK, IPAC, Group M, Miditech and several exciting start-ups such as Berootd, TrakRYT, GetVee Technologies among others. 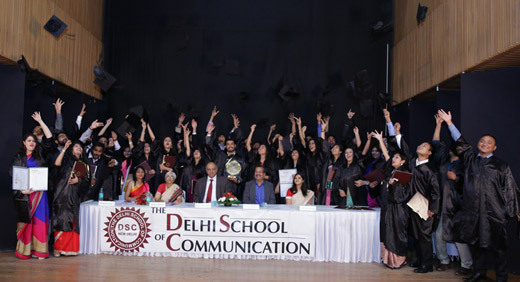 The Delhi School of Communication is a 20-year old institute that envisioned the concept of Integrated Marketing Communication (IMC) and has been offering an IMC programme to post graduates since 1995. It has contributed significantly to the communications industry, through its futuristic thinking. The flagship programme - The Post Graduate Diploma Programme in Communication (PGDPC) along with Master of Mass Communication/Masters in Business Administration (MMC/MBA). Besides, DSC also delivers short-term certificate programmes in - Advertising & Media, Public Relations, Event Management, Marketing and Sales, Grooming & Personality Development. Apart from the above courses, DSC also organizes workshops in key growth areas for corporate, to meet dynamic competitive challenges successfully.